Despite extensive media coverage of the Arizona–Sonora region painting a less than rosy picture, many positive things are happening in the border states. In the state of Sonora, Mexico, several projects are underway in different parts of the state. In Nogales, a city adjacent to the border, Puerta de Anza is under construction. This is a quality, master-planned community incorporating residential, industrial, retail, office and recreation. It is being dubbed the “New Nogales.” Housing is currently being built, and developers take pride in the project’s status as one of only two projects in the nation with the DUIS certification. The DUIS designation stands for “Integrated Sustainable Urban Development” and is similar to the LEED certification in the United States. When visiting the site, one can see that solar production areas, water treatments plants, parks and recreation are being constructed as part of the project. 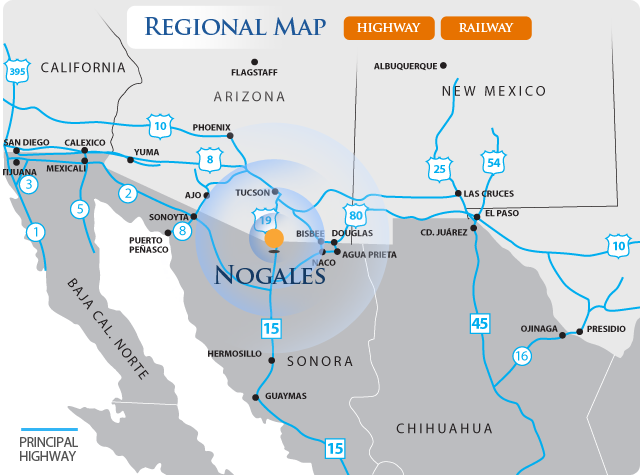 Another progressive development is Nogales Sur, located south of the city of Nogales. This project also combines residential and commercial/industrial areas to better serve the companies establishing initial operations in Mexico, relocating or expanding, and also to house their employees near—sometimes within walking distance --their jobs. Moving farther south in the state of Sonora, a significant project will be coming to Hermosillo, the capitol of the state. Ford Motor Company established in Mexico in 1925 and has recently announced a $1.3 billion investment at a plant in Hermosillo, Sonora. This plant has received awards recognizing quality and operations. In Guaymas, the seaport city some 250 miles south of the U. S. border, a concerted effort is underway to lead as Sonora’s Aerospace cluster. Companies from all over the world are making their aircraft components in Guaymas with the high quality needed to meet worldwide standards, as well as the competitive costs they need to assure they stay in business. Closer to home on the U.S. side of the border, we call attention to the Mariposa Port of Entry. This major investment in an expanded port of entry under construction will benefit both countries, both states, and the region, as Nogales is the most important port of entry in the region. Phase I was delivered four months ago, and Phase II is well underway, with an impressive infrastructure that will help expedite the crossing of goods between the United States and Mexico, reducing costs to business and consumer alike. Competitive costs, focused service, high skilled labor force, along with the recently announced expansion to the Port of Guaymas and the current expansion of the Mariposa Port of Entry in Nogales, will surely benefit the business climate in the Arizona–Sonora region. Together we are working to bring our residents great education, breadth of employment opportunities, and an overall enhanced standard of living and quality of life. 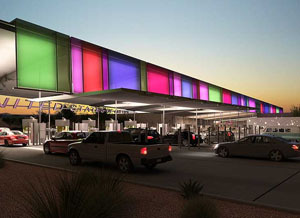 PICOR has a ten-year commitment to the border region and a 27 year history in Southern Arizona. PICOR is incorporated and licensed to sell real estate both north and south of the border. We are committed to helping companies establish their operations, whether first time, relocation or expansion. Mike Hammond SIOR CRE is PICOR’s President, Founder and Managing Shareholder, and leads the firm’s activity in the border region, specifically, the state of Sonora, Mexico, where PICOR is incorporated and licensed. He has been a sales and marketing trainer for the national Society of Industrial and Office Realtors (SIOR) for 20 years, is a Counselor of Real Estate (CRE) and is active in regional leadership with the Urban Land Institute (ULI). Denisse Angulo, A bilingual native of Sonora, Mexico, Denisse began at PICOR in 2005 as an intern, then launched her career as coordinator of the Alpha Group focusing on the industrial market. Today she is a regional marketing specialist advising companies and investors on both sides of the border in both English and Spanish. Denisse is licensed to sell real estate on both sides of the border, and is currently working on her MBA.